Earlier today, 20th Century Fox held their presentation at the CiemaCon convention in Las Vegas, which included the first trailer for Kingsman: The Golden Circle, slated for release on September 29. While this convention for movie theater owners isn't nearly as raucous as the fans who show up for Comic-Con every year, the new trailer for Kingsman 2 reportedly drew some of the biggest cheers from the crowd during the entire convention. While it isn't clear yet when this trailer will be released to the public, the studio has debuted a new poster, and we also have a description of the footage that was shown to the Las Vegas convention crowd. The Hollywood Reporter said that the new trailer opens with Taron Egerton's Eggsy having some fun in a spy car that comes complete with missiles. The trailer also reveals that a new spy threat has emerged, although pinpointing them has proven to be next to impossible, since the members of this organization remove all of their fingerprints, and even have their teeth filed down. This footage also shows the Kingsman mansion exploding, which leads both Eggsy and Merlin (Mark Strong) to get some help in Kentucky. Director Matthew Vaughn had previously revealed that this sequel will feature the American version of the Kingsman, known as the Statesman. The trailer also introduces Channing Tatum's character, described as a "southern spy operative" who has several gadgets at his disposal, including a lasso that can cut a man in half. The trailer also includes the first official look at Colin Firth's Harry Hart, who is seen wearing an eyepatch, presumably over the eye he was shot in towards the end of 2015's Kingsman: The Secret Service. Harry Hart's return has been confirmed for some time, but the details behind his supposed resurrection, after being presumably killed by Valentine (Samuel L. Jackson) in the first movie, have yet to be revealed. Earlier this month, we reported that this sequel has finally settled on a release date, taking the September 29 date, which will go up against Universal's American Made starring Tom Cruise and Sony's Flatliners remake starring Nina Dobrev and Diego Luna. The action sequel was previously set to hit theaters one week later on October 6, but that would have put it up against the highly-anticipated sci-fi sequel Blade Runner 2049, along with Lionsgate's My Little Pony. The movie was originally slated for release on June 16, but it would have had to face Pixar's Cars 3, Lionsgate's Tupac Shakur biopic All Eyez on Me and Sony's R-rated comedy Rough Night. Aside from Taron Egerton, Mark Strong and Colin Firth, the primary cast for Kingsman 2 will be made up of new actors such as Julianne Moore, who is playing the main villain, Halle Berry, Elton John, Pedro Pascal, Jeff Bridges and Vinnie Jones. Matthew Vaughn returns to direct Kingsman: The Golden Circle, working from a script he co-wrote with frequent collaborator Jane Goldman, based on characters created by Mark Millar and Dave Gibbons. 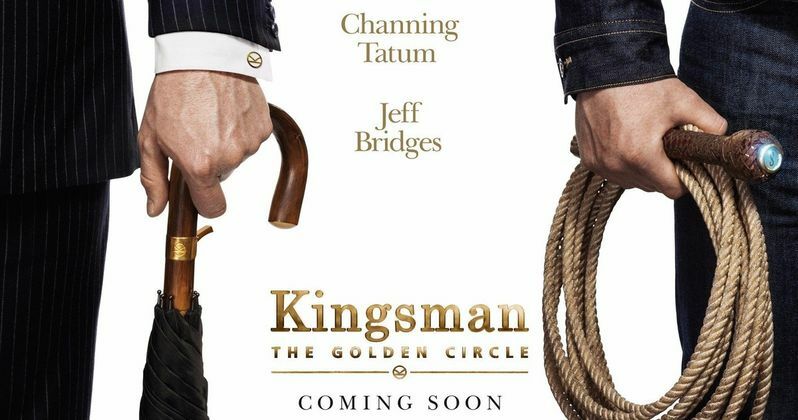 While we wait for 20th Century Fox to release this new trailer for Kingsman 2, take a look at this new poster below.